BELIEVE…in yourself. Believe that your hard work and undying efforts will PAY OFF and you will see a difference in your body. I found this AB RECIPE the other day. It’s from the website fitwithwendy.com. Lots of helpful motivational exercise and nutrition tips. Achieving your fitness goals involves several areas of lifestyle habits. It’s not just about eating CELERY. It would be good to read this ab recipe often to remind myself of all the areas I need to work on: Sleep, water, decrease stress, exercise, better food choices etc…STICK WITH IT. Patience is the hardest one of all!! water, r.e.m. sleep, protein, whole eggs, fish, SACRIFICE, poultry, lean red meat, beans, vegetables, eating at least 4 times per day, steamed broccoli, healthy fats, olive oil, flaxseed, fish oil, CLA, walking daily, avoiding alcohol, stretching daily, avoiding beer, eating small portions of dark chocolate 85% +, no added sugars, limit or no dairy, drink more water, avoiding foods and snacks that come in bright colored boxes and packages, lifting weights, pilates, yoga, jump rope, CONSISTENCY, swimming, dedication, stretching, drink more fresh water, eat lemons, eat apples dipped in almond butter, flexing, eating often, eat every 2.5 to 3 hours, avoid binge drinking, avoid white bread, white carbs, avoid starchy carbs after 4pm, eat more healthy fats, veggies and proteins, avoid yogurt with sugar added to it, avoid diet sodas, diet products, light products, and reduced fat products, PATIENCE. Plank: 2o seconds on 10 seconds off. 20 SETS!! THE BEST!!!! AFTER EACH ROUND RUN .25 MILE FAST!! 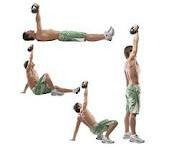 Finish with 100 sit ups holding a weight and lifting it over your head when you sit up. For added fun have your child stand at your feet and hold their hand up in all different spots. As you sit up, touch the weight to their hand!! In my AB searching I found a GREAT article. Check this out!!! It has about 20 different AB exercises with pictures and a few words on it’s really about the food you eat with how your abs look! Here is another one!! So good. Changing up routines and finding new exercises will keep you motivated!! My foot is making me mad. I’m not very patient. One week and it still hurts. I need serious motivation because I haven’t been eating well or exercising. If I can’t get running this week I will get biking and lifting and eating completely strict. A few photos like these HELP a ton!!!! Kick some TRASH for me this week!!! Complete 4 rounds of the following 10 exercises starting with 40 reps on the first round and then moving down to 30, 20, and 10 on the final round. After exercise #5 do 10 SPRINTS (100 ft) on each round. After we did the 4 rounds we had 2 BIRTHDAYS to celebrate. We take an exercise and do the number of reps of how old the person is! So, we did 31 AB JACKS (hold a plank and hop your legs out and in). and then 37 of each of the next 4 AB EXERCISES. That’s all for now!! Hit it hard!